People who like to keep their pantries stocked with fresh seasonal fruits and vegetables should consider themselves blessed if they live in the Bay Area: There are farmers’ markets just about every day of the week. 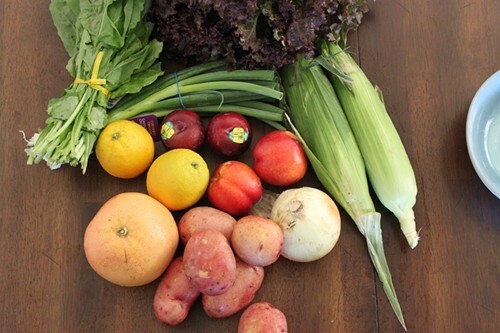 There are weekly community-supported agriculture (CSA) boxes you can pick up or have delivered to your home. Even many of the regular supermarkets — from Berkeley Bowl on down — have produce sections impressive enough to make out-of-staters fly into a jealous rage. So it wasn’t as a response to a shortage of options that Corey Tufts and Wayne Pierson tossed their hat in the ring. The two Coast Guard veterans founded Golden Gate Organics, an Alameda-based organic produce delivery service, almost exactly one year ago. Although the business is still developing its customer base, Tufts and Pierson feel confident that convenience- and budget-minded shoppers will find value in their weekly organic fruit and vegetable box. Tufts told me that he and Pierson became fast friends in 2002 when they met aboard the U.S. Coast Guard Cutter Morgenthau (which has its homeport in Alameda), both of them fresh out of bootcamp. Fast forward to a couple of years ago, after both men had continued their military service elsewhere — by 2010, Tufts had been transferred back to Alameda, and Pierson had left the Coast Guard and was employed at a Colorado-based organic produce delivery company. He’d worked his way up from delivery driver to web programmer. Pierson had been talking up his newfound passion for organic fruits and vegetables for years, and it wasn’t long before Tufts — initially skeptical — became a convert. So when Pierson suggested starting their own company, Tufts was ready. Pierson spent about six months building the website from scratch — with a custom-designed user interface — and by July of last year, Golden Gate Organics had picked up its first customers. The idea is fairly straightforward: Customers log on to the website and sign up for a box — small, medium, or large. You enter your personal preferences, so if you indicate that you hate spinach, it won’t show up in your box. And week by week, you have a chance to customize your box further — up to three substitutions. 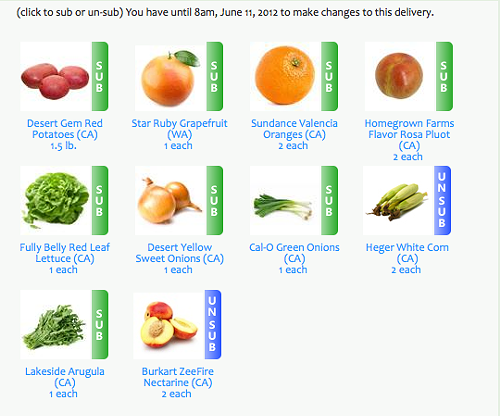 On Tuesdays, a box of organic produce is delivered to whatever address you’ve specified. The contents of a small box of organic produce. Unlike some CSAs, there’s no commitment required — you can try the service for a single week; you can stop shipments when you’re on vacation, or even for the entire summer. “We’re not a cell phone company; you don’t have to sign up for two years or whatever,” Tufts explained. Furthermore, in most cases the CSA model is tied to a single farm, or to a small group of farms, which has obvious advantages — especially if the customer wants to develop a personal relationship with the people who are growing the food. But Tufts and Pierson decided they wanted to cast a wider net in order to maximize the choices they could offer to customers. So in any given week, a box from Golden Gate Organics might include produce from as many as fourteen different organic farms, the vast majority of them located in Northern California. And while Golden Gate Organics honors the seasonality of produce — they won’t put tomatoes in your box in December — their business model also allows them to bring things in from out of state, or even from abroad, to satisfy customer demand. For instance, they offer Fair Trade bananas from Peru for much of the year. Tufts acknowledged that this means the boxes they’re trucking out from their Alameda warehouse on Tuesday mornings might not be as “local” as what you’d buy at your neighborhood farmers’ market, but he stressed that their policy is complete transparency: The individual farms (and each one’s respective distance from the company’s Alameda warehouse) are all listed on the website, along with which items from that farm are included in a particular week’s produce offerings. If you don’t want bananas from Peru or cherries from Washington — whether for ideological reasons or gustatory ones — you can swap them out for something more local. For instance, when I signed up for a sample box a few weeks ago, I didn’t want early-season tomatoes (from Mexico), and I wasn’t particularly excited about getting apples — I’d eaten enough of those in the fall and winter months. No problem: I just subbed those two items out, replacing them with some sweet bi-color corn and a couple of Zee Fire nectarines. The substitutions ended up being my favorite items in the box. One of the main things that Tufts argues sets his company apart is the user-friendly interface that Pierson custom-designed specifically for the purpose of selling produce, as opposed to adapting an existing e-commerce interface — something Tufts claims had never been done before. I don’t know about that, but I can vouch for the fact that the website is clean-looking and easy to navigate — it’s easy to fill out your preferences, easy to sub items in and out. 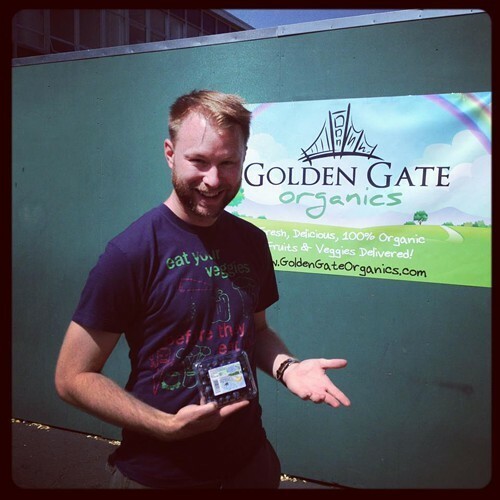 A year since the company was founded, Golden Gate Organics now has about 170 active customers, according to Tufts. Their delivery zone extends from Richmond down to Hayward and out to Walnut Creek, and they recently started delivering to San Francisco as well. Tufts acknowledged that a lot of organic food buyers are still going to prefer shopping at a farmers’ market, where they can talk to the farmers directly and pick out each individual piece of fruit. But he said there are plenty of other potential customers to whom the convenience of a weekly delivery service is going to be very appealing — families with kids or young professionals, who might want to spend their Saturday morning at the market. And anyway, in cases where people are choosing to buy healthy, organic produce from another source, Tufts said the entrepreneurial aspect of the business gets trumped by the “mission” aspect — his desire that people pay more attention to what they’re eating and where their food is coming from.